The iMedicWare iPortal has been enhanced to create a better user experience for both patients, and the practices that they belong to. iPortal works as both a user-friendly interface where patients can interact with their provider, while simultaneously generating additional analytic information for the practice. iPortal establishes a platform to advance healthcare communications, while creating marketing excellence for practitioners. iMedicWare, a leading provider of EHR and EPM software for the ophthalmic community, announces that its patient portal has been completely redesigned to make it easier and more efficient for ophthalmic business owners to access powerful data that can inform them about their current patients, and advise them on the effectiveness and direction of their marketing campaigns. Mobile Friendly – Patients can access their charts with any internet-enabled device, which includes all tablets and smartphones. The new design enables patients to access their records “on the go” and they can even view statements and request appointments directly from the device. 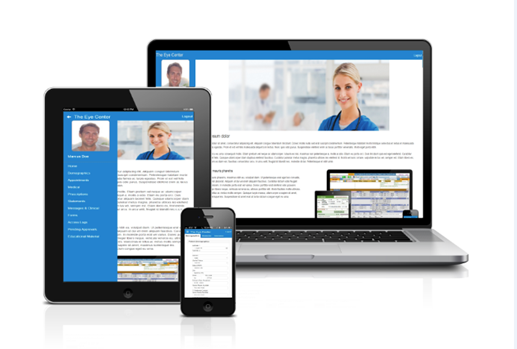 User Interface Redesign – The new interface allows patients to access and update their information quickly and easily. This allows them to view prescriptions, update their insurances, and also track their upcoming appointments with the push of a button. Practices also can customize their iPortal’s home page in any style, which allows their patients to see information about the practice itself or even take advantage of special advertisements and coupons posted to the portal. Integration with Google Analytics™ – iPortal is now fully integrated with Google Analytics. This is a powerful tool for practices, as it gives meaningful and straight-forward analyses of all the information related to the patients’ behaviors on the practice’s portal and throughout the internet. The practice has full access to see how these patients first discovered the practice, how much of their portal is being used, and even how many new visitors come to the site compared to repeat visitors. Equipped with this information, a practice can more precisely target specific patient interests, geographical regions, and demographics, resulting in more successful marketing campaigns. This integration provides iMedicWare users with both a powerful marketing and advertising tool, and the analytical software, to focus their efforts on expanding their business while simultaneously saving them countless amounts of time, money, and effort. iMedicWare Inc. is a leading provider of certified EMR/EPM and ASC software specifically designed for ophthalmologists. Founded in 2006, iMedicWare was created by a group of leading specialty ophthalmologists who sought to create an efficient, paperless, solution. They wanted a product specifically geared towards maximizing the efficiency of their practices, while also being comprehensive, easy to use, and customization. Their different backgrounds allowed them to design software that would perfectly fit any ophthalmological practice, from general to pediatric ophthalmologists, including all ophthalmological sub-specialties like neuro-ophthalmology, corneal surgeons, and retina specialists. The end result is that iMedicWare delivers the best, physician-approved, EMR, EPM, and ASC software solutions for ophthalmology practices and ambulatory surgery centers of any size, specialty, and scope.